Articulating and communicating their evolved brand vision and position. 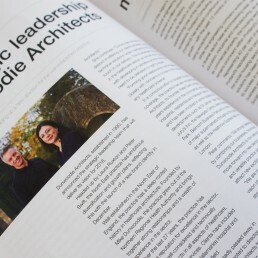 In 2016, Dunwoodie Architects (established in 1990), experienced significant leadership change when their founder passed away and Laura Ruxton became the practice’s new director. With the changes managed internally and the acquisition of another regional architects, Laura and her team needed to articulate and communicate their evolved brand vision and position. Its strong heritage in the healthcare sector as well as the addition of expertise in others. 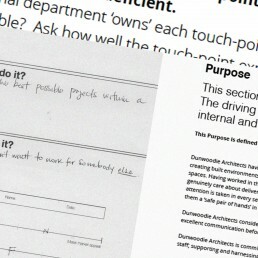 With its strong heritage in the healthcare sector and the addition of further expertise in other sectors, Dunwoodie Architects needed to communicate their revised proposition by redefining their brand and developing an accompanying brand identity, website and launch communications. Breathing new life into a brand that's lasted over 25 years. A repositioned brand with a clear strategic vision, and a contemporary and forward-looking brand identity, website, photography and PR. "Wonderstuff knew what we wanted to achieve and more..."